Ceibo may be Argentina’s national flower, but Ceiba is its most iconic flower. That’s right—Ceibo and Ceiba are two, completely unrelated species! Ceibo is the common name in Argentina for Erythrina crista-galli, a tree in the family Fabaceae, while Ceiba is a genus of flowering trees in the family Bombacaceae that includes the species pictured above—Ceiba speciosa (syn. Chorisia speciosa), known in Argentina as “Palo Borracho.” This translates literally to “drunken stick”—a reference to the pot-bellied trunk with narrowed base that gives the tree the appearance of a wine bottle (Haene and Aparicio 2007). Native to the dry forests of northeastern Argentina, C. speciosa has become an enormously popular street tree in the country due to their dazzling displays of hot pink blossoms, especially in Buenos Aires whose green spaces and wide boulevards are lined with grand old specimens. Interspersed amongst the pink flowering trees are occasional specimens with the flowers mostly white but otherwise looking much the same as C. speciosa. These are the closely related species C. chodattii (syn. Chorisia insignis), or Yuchán. This species is native to more western, even drier areas of northern Argentina than C. speciosa and has also become popular as an ornamental tree in urban areas, though it has been planted with less frequency than its hot pink-flowered congener. Bombacaceae also contains the famously odd baobab and kapok trees—also distingished by bulging trunks that serve as an adaptation for water storage in seasonally dry environments. 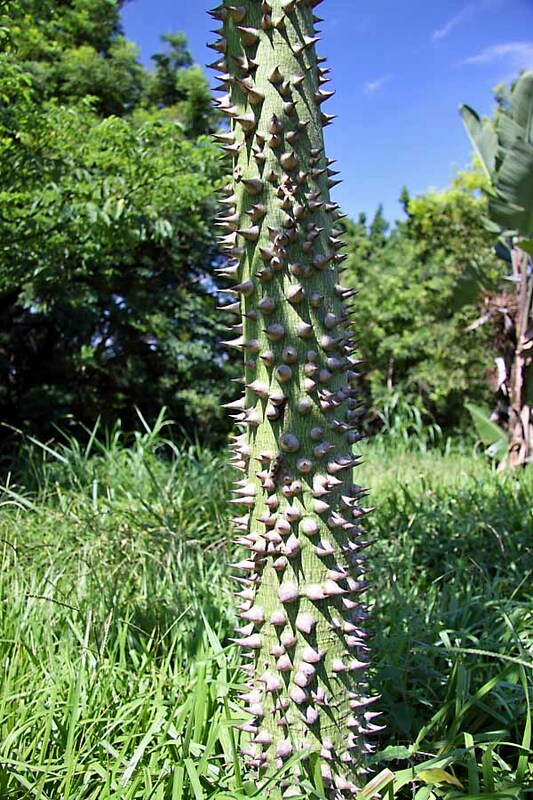 The trunks of Ceiba trees exhibit an additional water conservation adaptation with thick, conical-shaped thorns that are also capable of water storage. 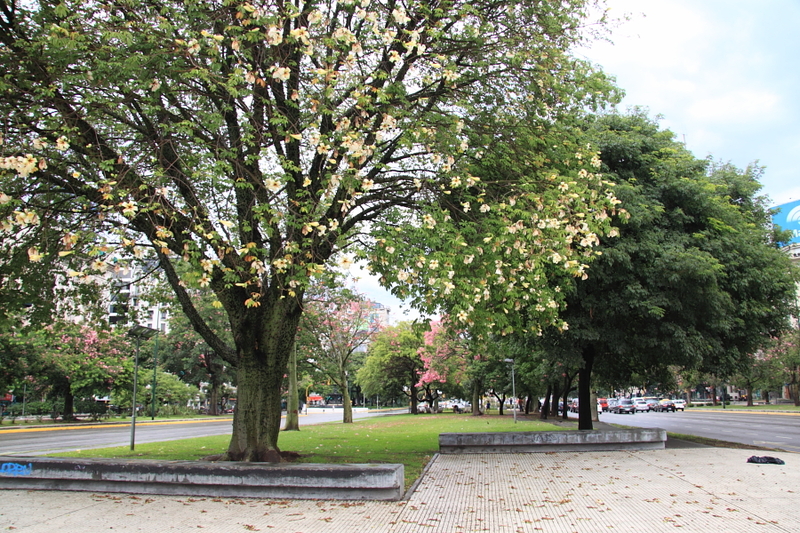 The young tree picture here was photographed in Campinas, Brazil and exhibits the green coloration typical of younger trees that functions to augment their photosynthetic capabilities. In fact, the dry forests in which Ceiba spp. evolved often contain a number of unrelated plants that also are thorny and have green bark. Haene, E. and G. Aparicio. 2007. 100 Trees of Argentina. Editorial Albatros, Buenos Aires, República Argentina, 128 pp. This entry was posted in Bombacaceae, Plantae and tagged Argentina, Botany, Friday flower, nature, science, trees. Bookmark the permalink. I first learned these trees back in high school — very distinctive, and somewhat popular as park and street trees where I lived in southern California. Cool, I didn’t know we had them here in the US. I would like one of these trees; where does it grow the best as I live in south Texas. Here is a photo of a tree growing in San Antonio, so I would think they could do fine further south in Texas. 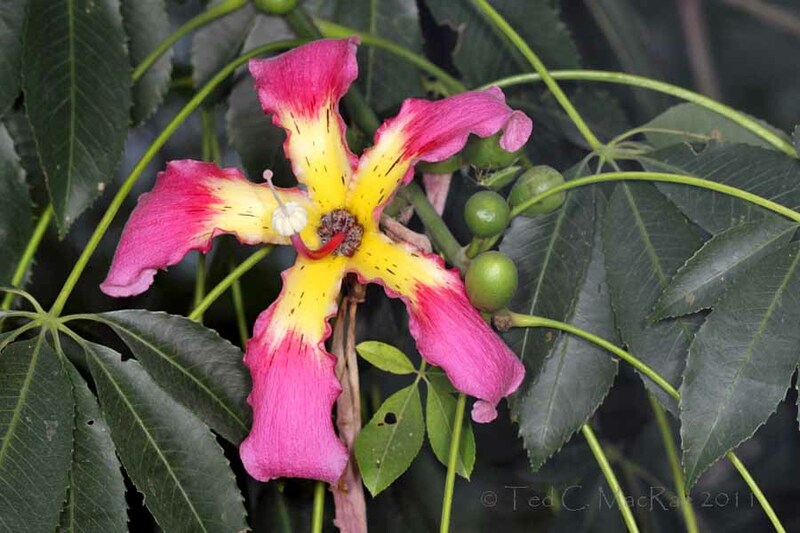 Google “Ceiba speciosa” or “Chorisia speciosa” to find a vendor.